I was so happy when I discovered Grace’s Stripes and Sequins blog, and at the time, I was in a serious statement necklace phase. So, I was clearly ecstatic to come across her post, a collaboration with Holst & Lee, on how to make a tassle necklace! I followed the directions on Grace’s post religiously. At the time I was making it, it was the most difficult necklace I had ever attempted, but Grace’s instructions were flawless and it turned out really well! Hardware: At Home Depot (in the plumbing section), the end caps are called compresison caps. I tried looking for them myself, but after several “May I help you find something, miss?” inquiries, I ended up just showing an employee the picture on Grace’s website. I recommend doing just that to find the hardware you need quickly! A girl wandering the aisles of Home Depot alone definitely does not look like she belongs there. Beading supplies: I bought a few colors of fringe, and got at least a foot of each, but you definitely do NOT need that much. I’d say 6 inches is plenty for one necklace. I also recommend making sure you buy a fringe that looks smooth, a bit heavy, and full. I bought one color that was a little thinner and scragglier, that I thought I could iron out to be straight, but it ended up not making very good tassles. Anyway, this was/is my favorite DIY necklace, and I get a ton of compliments on it. This is another necklace that is great to wear under a plain tee or a collared shirt! 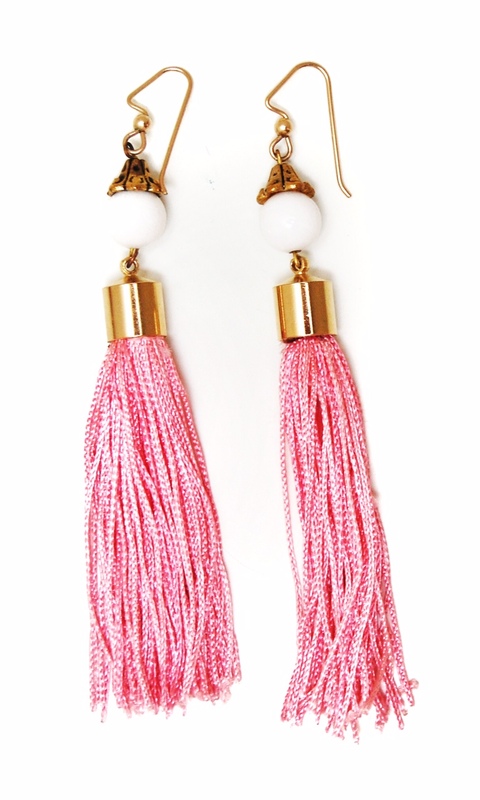 I also couldn’t resist making Grace’s tassle earrings. I mean, I had extra supplies! I don’t wear them with the necklace though - gotta avoid being too matchy matchy!